I saw this while training my mage at Bains. I dont think this is possible wo hacking. And she reached 120 by 15. We should all log tickets to nexon to get her banned. Seriously, this is the biggest BS ever, she was 97 10 hours in. I don't care how much 2x you have, that's flippin impossible without hacking, and she deserves to be banned accordingly. Jesus, it's taken me 3 years to get to 63... >_> How the hell? Not so sure I agree with the last part, but the beginning is true. It's possible to get to 120 in a week with leeching and 2x. ... but I don't care how fast Cygnus training is, how the hell do you get 120 levels in 20 hours? I keep hearing about all of the different EXP multipliers stacking (the family thing, some pendant... perhaps there was an even in there), and they just leeched at Skeles once they were able to. It's not much of an accomplishment to me, but it is a pretty lame way to ninja an iPod. People are so stupid... what a waste. Not even a day and we have a max level. Strombidae - 123 Windia Hero. 2-monster hitting Brandish is so hot. 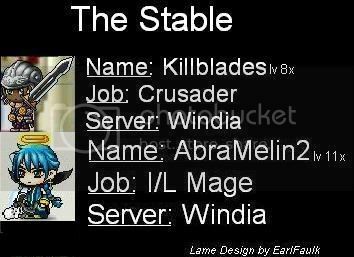 SeasonabIe - 49 Windia Cleric. Unmotivated to level. ??????? - Night Walker in progress. That's just crazy. The closest CK in levels is only 101. I also find it funny that while thieves are known for fast leveling, the current highest CK thief is below all the other highest CK classes. It's because leeching is serious business, and thieves have pride! I think. I expected some amount of leech-associated powerleveling, but this is ridiculous. Not even a whole day has passed and someone's maxed it. Sort of defeats the purpose of even trying. I'm back and representin' Galicia. BECAUSE I'M CLINICALLY INSANE, THAT'S WHY! The weirdest part is the person that owns the char is a guy! Edited by xDannykeeper, 30 July 2009 - 02:42 PM. I imagine we will see another load of 120s in the nest few days popping up in the Cygnus Kngiht area. At least there are some smart hackers that don't go from 1 to 120/200. She should seriously be banned. 120 levels in 20 hours......It takes more than an hour to level once you get past level 80. That is THE DUMBEST hacker. Apparently, there was a hack that came out that lets the Knight's summon hit EVERYTHING on the map reallyyyy fast. 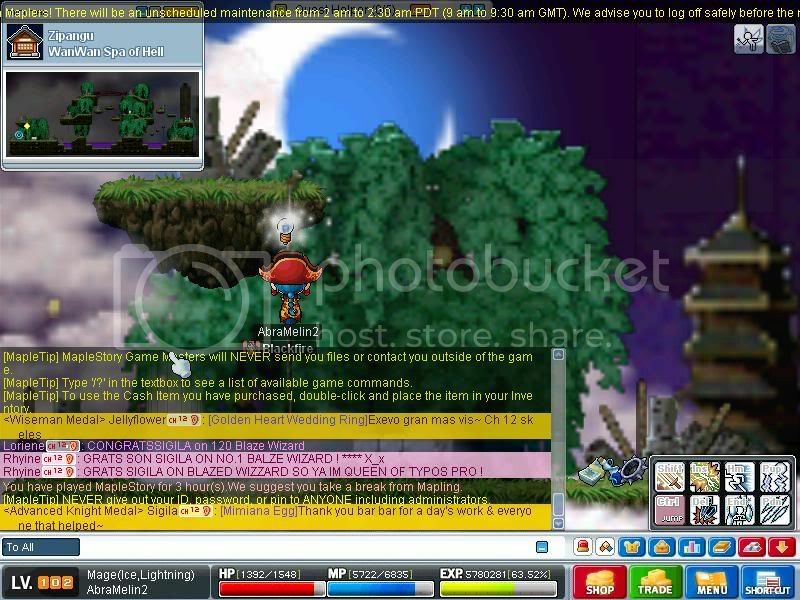 My friend sent me a screenie on MSN last night of it, I hope it was fixed in last night's SC.. I don't think Nexon cares. Seriously, Nexon needs to step their game up and give out bans to people who actually deserve them. I promise you guys when BlazeCraig gets to 120 by September [if he does] he will be 150% legit! Probably just PG leeched at skeles from 26 to 120. People with money can do whatever they want. lol. Now there's like 20 120's in Windia. Do some research. Sigila is also Lachrymus of Windia, who's a level 200 bowmaster WHO ALSO has the help of his guild. I wonder if the other 20 level 120's in Windia also had a level 200, and help with a guild. But even with leech, 2x EXP, reaching level 120 in 20 hours is impossible. Maybe a week, but 20 hours? This is a joke.